Memorial Day weekend is only half over, and already the roadside treasures have been practically leaping into my lap! I was out walking Mu Shu yesterday when a sign reading "Multi-Family Garage Sale" snagged my attention. Since I'm on the prowl for inexpensive furniture to help Lovely Daughters #1 and #2 furnish their Funny Little House, I had to stop. The gentleman selling it, who looked to be in his late 50s or early 60s, said it belonged to his grandfather. Maybe so, maybe not. An all-over inspection revealed that it was made in two pieces--top and bottom--as many secretaries were, to facilitate moving. It has dovetail construction in the drawers (a good sign) and no visible manufacturer's marks anywhere that I could find (a neutral sign; not all fine pieces are signed, stamped, or marked). Judging from its look and from what the gentleman selling it said, I'm guessing it's a modest piece of American furniture, dating from the 1930s or 1940s. It has patriotic hardware. Colonial American stuff was big in the late 1940s and 1950s, if I have my furniture history right. 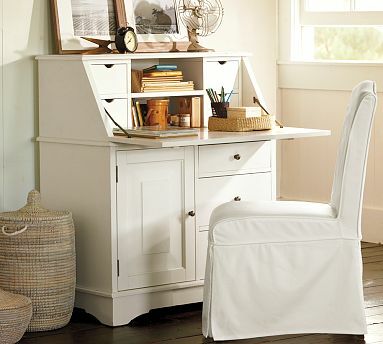 Anyway, the point is, it's a well-made but not super-special piece, so there's no crime in swapping out the hardware for something more up to date and painting it white, like the Pottery Barn secretary in the photo below. I think it would look wonderful to paint the inside of the glassed-in cabinet an accent color--sky blue? cobalt? persimmon? I looked at the PB website to see how much the secretary in the photo above costs. They don't seem to offer it any more, but I found one for sale that is essentially the bottom half of my found secretary--no glass cabinets lined with shelves. And this puppy sells for $799! So, I am very happy that I got more secretary for far less money. I wangled a price of $60 from the gentleman (he initially asked for $75). I thought Lovely Daughters #1 and #2 might be happy about that, too. But I had to check with them first. I called Lovely Daughter #2 on the phone and sent her some pictures, who then Skyped the photos to Lovely Daughter #1 (currently abroad). We all gave it the thumbs up. So some day soon the little secretary will be the focus of a family painting party. Then it will travel down the freeway to Funny Little House, where it will either serve as somebody's small desk, or it will hold clothes, or it will be filled with teacups and placemats and set in the dining room. Any way it's used, it will be a great little piece. A quick cleanup, and they are ready to showcase some family photos, keepsake invitations or announcements, or even scraps of beautiful fabric. They can even be used to torment family pets. Rainbow pug, anyone? You can't tell from his expression, but Pao Pao is very pleased with my curbside finds.